Hi, I'm Zoë and I absolutely love running Talking Tots in Edinburgh! As a Mum of two boys, Isaac now aged 11 and Gabriel now aged 9, who between them experienced hearing, pronunciation and confidence difficulties, I understand just how important it is to support our children's communication development, and allow them to achieve their potential. I am passionate about the Talking Tots programme and it is such a privilege to be able to watch so many children learn and demonstrate the many key skills they build in our classes! Devised by experts and with an ethos of learning through play, our fun, engaging and interactive sessions boost your child's language and social development from the age of 4 months right through to preschool! Delays in speech and language development are increasingly common (more than 1 in 10 children), and can impact on all stages of education and even adult life if not supported, and yet there is so much we can do to help our wee ones as they are getting grips with one of life's most important skills. Talking Tots classes are aimed at ALL children, from those still trying to master their first words to fully fledged chatterboxes, but can be invaluable for those who require extra support. The wide range of skills we develop means there is something for everyone to learn, and always plenty of fun to be had! In addition to our classes, Talking Tots Edinburgh offers sessions in your local nursery or pre-school, playgroup or mother and toddler group. These can be for a special occasion, series of classes, or a regular class. For birthdays and special occasions, I offer party packages tailor-made to suit your needs. If you are unable to attend our regular classes, I also offer 1-1 interactive play sessions with your child and yourself to support language development. If you would like to find out more about Talking Tots or BabyTalk or have any questions, please don't hesitate to get in touch by clicking on the red box on the right. I look forward to welcoming you and your child very soon! TERM DATES - Our new term begins Tuesday 23rd April and runs for 10 weeks (9 weeks for Monday classes). Get in touch to find out more and reserve your place! It is fine to join part way through a term, just get in touch to check there are spaces in your nearest class. NEW CLASSES - From next term, we will be running a new Sprites class at 10am Wednesdays in Corstorphine, and a new Sprinters class at 2.15pm Mondays in Stockbridge! INTRODUCTORY HALF PRICE OFFER - your first 3 classes for just £9 (12months+). This gives you chance to see what we get up to in class, lets your child settle in, and begins to show you the benefits of coming regularly. Classes are approximately 40/45 minute long and cost £6 each, payable half termly/termly. One sibling/twin joins in for free. 10% off full term fees for members. 20% off your first full term if you have previously attended BabyTalk! Sprites - 'boosting early chatter' is for 1 - 2 year olds. Sprinters - 'building confident communication' is for 2 - 3 year olds. Sparklers - 'paving the way for school' is for 3 - 5 year olds. Mixed age classes are carefully planned so all ages benefit from our games. BabyTalk - 'babbling babies' is for 4 - 12 month olds and runs in 6 week blocks - click on BabyTalk tab above for more information. Our next blocks starting in May - now taking bookings! MEMBERSHIP PACK - for just £12.50 your child receives their own exclusive Talking Tots drawstring bag including a cotton Talking Tots T-shirt, colouring book, membership certificate, balloon, bubbles, and more! Members also get 10% off full term bookings and special events. Please let me know ahead of your class if you'd like to purchase a membership pack stating which size t-shirt you require (1/2 yrs, 3/4 yrs, 5/6 yrs). To book a class or find out more about Talking Tots Edinburgh, please get in touch by clicking on the red message box on the right! If you don't see a class that suits you, please let us know as we regularly review and update our class timetable to ensure it meets current demand. (starting 7th May) Liberton Kirk Halls, 5a Kirkgate, Edinburgh EH16 6RY. Don't just take our word for it - read what those who have come to our classes have to say! My wee boy, Harvey and I went to Zoe's BabyTalk class at the start of the year and really enjoyed it. Zoe is lovely and gave me lots of ideas for fun games to play with Harvey at home. Would highly recommend her class. 'Talking Tots is a fantastic class and we are so happy we signed up for it. Zoe makes the class fun and interactive each week and has boundless patience in encouraging the children to communicate and associate words with pictures and actions in a fun and involved way. My daughter's speech has improved vastly since she started Talking Tots and she enjoys reading the books shared after class. I highly recommend Talking Tots, it's a great way to encourage your child to speak in a fun and supportive environment. Zoe is fantastic at what she does. My sons absolutely loved attending classes and we are a bit sad that Mason is too old to attend now. If you're thinking about joining a fun but educational then definitely give this one a try, you won't be disappointed! Alexander is always happy and excited to come to Talking Tots and he loves wearing his TT t-shirt. Over the two terms' he's been attending so far, he's really come a long way, he's growing in confidence and is talking more than before. Thank you Zoe these classes are wonderful! I cannot recommend Zoe's class enough. Talking Tots has brought my wee boy Callum on leaps and bounds. At the beginning of the year I was an extremely worried mum with a 2 and half year old boy who only said 5 words and wasn't getting any better. Zoe always gave me help and advice when I asked and really took the time to help. In weeks when I was exhausted and really struggling to help him, I knew that taking him to this class helped both him and me. Through speech therapy, doing 121 work with him myself and through this wonderful class he has now started school nursery a few weeks ago with over 100 words! What an absolutely amazing class. Thank you for a great session, it was really good and kept the children intriged. Your session was informative and fun for the kids. Ashhar really enjoyed his classes. I definitely would recommend these classes to other children. You have a great teaching strategy and add the fun factor into it! We enjoy the classes as it gives me time to focus on Euan. He always loves coming and it's great to see how much progress he's made since starting nearly 2 years ago. I have taken part along with my grandson in Talking Tots sessions each week for several months. The fun sessions have helped his communications skills so much - he has learned in a relaxed fun way to listen carefully and follow instructions, and these skills taught by Zoe in a kind and structured way while playing and having fun, have really brought him on in terms of his speech and understanding. Talking Tots have helped my little grandson prepare for nursery school by teaching to communicate and work with others, all through playing games and storytelling, and I would recommend Talking Tots without hesitation. My 2 year old loved Zoe's Talking Tots session! She was held spellbound for 40 minutes by the games, stories, songs and exercises. It was a pleasure to watch the concentration, thoughts and expressions cross my daughter's face throughout the class. I've never seen her that focused on joining in with a group and listening intently. The venue was also excellent. We will be back. Our Sprites enjoying an action matching game! Listening and copying in our musical action games! Singing and waving goodbye to everyone at the end of class. Bubbles at Christmas in Liberton! Fun at our Christmas Party in Stockbridge! BabyTalk is a delightful 6 week course focusing on early interactions and developing communication and social skills with your baby. It is suitable for babies between 4 and 12 months of age, and is a great opportunity to learn together with your child through our fun and varied activities. From 4 months babies are interacting much more with their environments, so it's the perfect time to make the most of this and engage with them in a positive way. For older babies who are becoming more mobile and wanting to explore our course offers them a gentle introduction to participating more actively with games and communicating with others in different ways. Each 1 hour class looks at a different key topic such as eye-contact, turn-taking, copying and first words and combines gentle interactive play, group games, rhymes and songs with relaxed informed discussion. We end each session with heuristic (discovery) play for the babies and refreshments for the grown ups! Our classes are designed to both boost your child's communication and social development and to further your own understanding so you can support them through play and interaction at home. Our groups are small and friendly to encourage conversation and everyone is made to feel welcome and relaxed. It is absolutely fine if your baby cries or needs to feed, sleep or be changed etc. Many of our mums have enjoyed getting to know each other and the other babies and have kept in touch following our course. If you have to miss a class for whatever reason you are always welcome to make up the corresponding week at a future course (numbers depending, please get in touch to confirm). READ OUR 5 STAR REVIEWS ON OUR TESTIMONIALS PAGE! BabyTalk costs £55 for the full 6 weeks (including refreshments and weekly information handouts on the key topics). 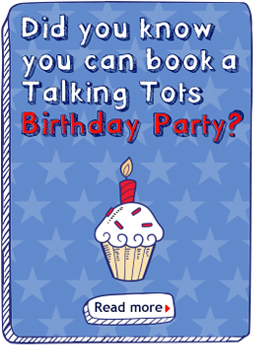 Everyone attending BabyTalk gets a 20% discount off their first term of Talking Tots classes after their child's first birthday. Liberton Kirk, Kirkgate EH16 6RY. Tuesdays, 10-11am. 7th, 14th, 21st, 28th May, 4th and 11th June. Inverleith St. Serf's Church Centre, EH5 3BD. Thursdays 10-11am. 9th, 16th, 23rd, 30th May, 6th and 13th June. Further courses will run across the city through the year according to demand - tell us where and when you'd like to see BabyTalk running! We can also run private BabyTalk courses for you and a group of friends/antenatal mums - get in touch to find out more! Please get in touch by clicking on the red box on the right to find out more and reserve your place!